Peninsula Developmental Road is the main road up north. However, it does not go up all the way to the Tip. After the Weipa turnoff, or rather the intersection where the Peninsula Developmental itself turns west to Weipa, to head to the Tip you turn onto the Telegraph Road. That is a smaller road. The peninsula's best and most maintained road - the Peninsula Developmental goes to Weipa. A lot of the time it is a very straight road, red-soiled, unsealed, and can be corrugated. South of Cooktown you have the small townships of Lakeland and Laura. After Palmer River Roadhouse the Peninsula Developmental Road crosses Byerstown Range with a lookout point on the top of it, and then descends to flat country again before it comes to the small township of Lakeland Downs. 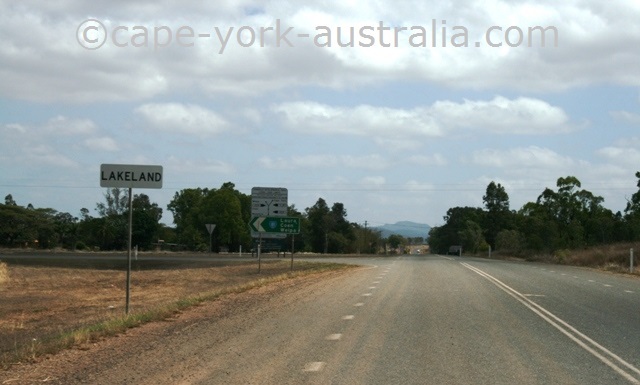 Lakeland Downs is on the crossroads where you can also turn into Mulligan Highway to the coast and Cooktown. But continuing on the Peninsula Developmental Road you come past Laura Festival Grounds and Split Rock Art Gallery to the small town of Laura. North of Cooktown you have Hann River and Musgrave, and they are only roadhouses, not small towns. After Laura the road is unsealed (as of 2014 - they are gradually getting on with sealing it). You drive past the turnoffs to Jowalbinna and Lakefield National Park, then the Fairview Outstation near the southern turnoff to Alice River Goldfields before you get to Hann River Roadhouse. After Hann River Roadhouse the strait stretch of road (with some views like on the large photo in the beginning of this page) continues north past the northern turnoff to Alice River Goldfields, Artemis Station, and then Musgrave. North of Musgrave you start coming into central Cape York, and you first have the small township of Coen, then the Archer River Roadhouse. 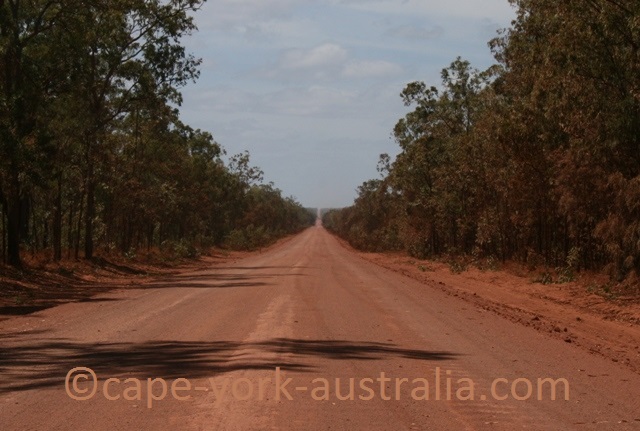 After that the Peninsula Developmental Road turns off to Weipa where it ends, never entering northern Cape York. After Musgrave (which is on the crossroads to Lakefield National Park to the east and Pormpuraaw to the west) the Peninsula Developmental Road continues north past the turnoffs to Kendall River Road and Port Stewart to the small town of Coen. After Coen you drive past the Coen Quarantine Station (do read the rules) and the turnoff to Mungkan Kaanju National Park (now Oyala Thumotang CYPAL) to Archer River Roadhouse - a pleasant place to stay and enjoy the famous Archer River burger with chips. 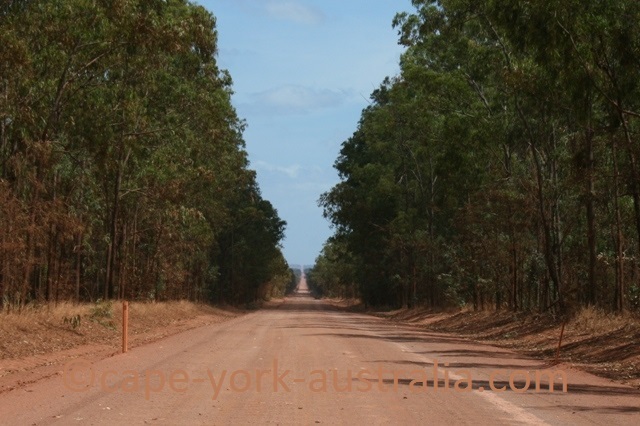 After Archer River Roadhouse you first pass the turnoff to Iron Range National Park, Portland Roads and Lockhart River, before you come to the intersection where the Telegraph Road turns off to go north, and the Peninsula Developmental continues to Weipa. 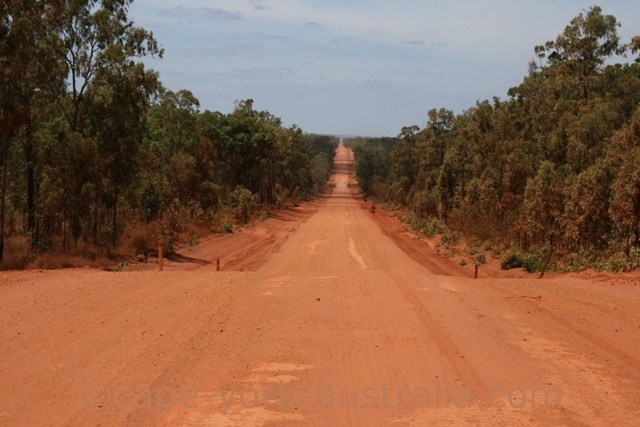 The road to Weipa gets first a little smaller but later gradually better after it passes by the turnoffs to Merluna Station, Aurukun and Batavia Downs, and soon you are at the peninsula's northernmost traffic lights as you cross the hauling road of Weipa Mine.